One driver died on the spot while a handyman was seriously injured in major road mishap on National Highway 37 at Lotabari area in Bokakhat under Golaghat district on Saturday. The deceased has been identified as Toufiq Ahmed, who was driving a 407 goods-carrying vehicle (registration No AS 01-EC-0688) while the handyman has been identified as Sahidul Hussain. Both Toufiq and Sahidul hail from Barpeta district. As per reports, the road mishap took place when the 407 goods-carrying vehicle, which was coming from Guwahati to Jorhat, collided head-on with a truck (registration No AS01-JC-2751) coming from the opposite direction. Both the vehicles fell into a ditch along the National Highway after the mishap. Later police recovered the body of the deceased from the spot while seriously injured handyman Sahidul Hussain was admitted to the Swahid Kamala Miri Civil Hospital in Bokakhat. It may be mentioned that the road mishaps frequently occur in Bokakhat area. A series of road mishaps took place last month. On April 18, 2018 a road mishap took place at Methani in Bokakhat involving bikers that left one dead and another critically injured. According to witnesses, two youth, Khirod Dutta of Bishnupur and Sugat Bhuyan of Jyotipur were coming towards Bokakhat from Kaziranga performing stunts on the National Highway 37. Even as they reached Methani tea estate near Bokakhat, the bikers collided among themselves resulting in the fatal mishap. On April 13, 2018 two persons were killed on the spot in another road mishap at BokakhatThe road mishap took place near the factory of Methani Tea Estate. 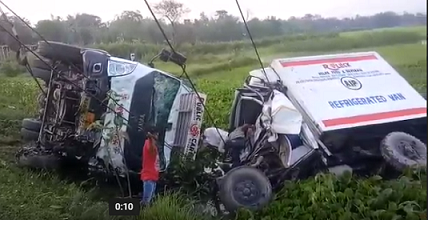 A goods-laden truck bearing registration number AS 25C- 6393 mowed down a motorcycle bearing registration No AS 03-W-1105 killing both the biker and the pillion rider on the spot.